Find amazing art that will transform where you live or work with the help of our network of art advisors, galleries and artists. To get started, just tell us a little bit about yourself and your art needs. We'll do the rest, working with our extensive network of art experts and professionals to recommend high quality, original art that reflects your style and fits your budget. Looking for further curation and advice? Art has the unique power to completely change the look and personality of a room - it reflects your style and personality in a way that few pieces of furniture can. But, art is often last when it comes to design, behind furniture, rugs and accessories. So why is art usually at the bottom of the list? Because most people don’t know where to start, don’t have the time to explore and learn about art, aren't comfortable determining if the art is good quality or think it won't fit their budget. That’s where Keenlee comes in. We’re making the process of finding high quality, original art approachable, easy and affordable. Thank you for submitting your art question to Keenlee! We'll begin working with the Keenlee network of art professionals immediately to research your question and will respond as soon as possible. If you're ready to use the Keenlee network for help buying art, please complete your Art Profile here. Get personalized, curated art that fits your home, your business or your collection. 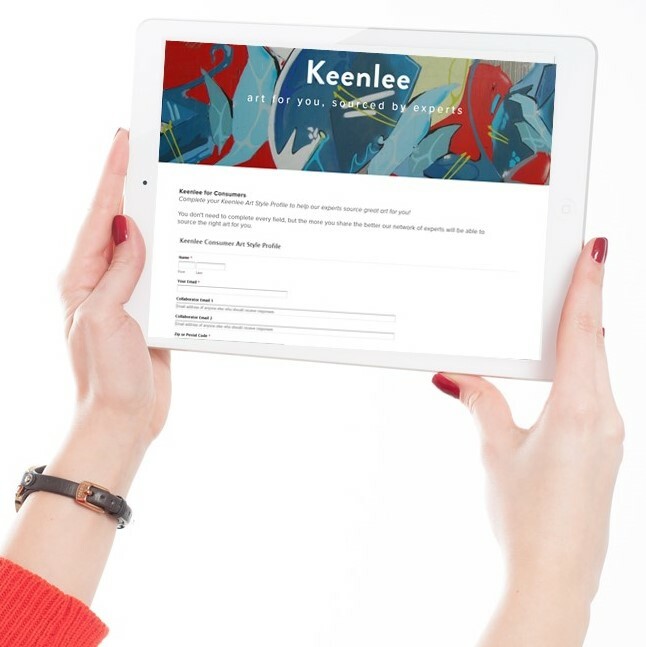 Join our network of art experts and work with Keenlee clients to help them source great art. Connect with enthusiastic art consumers who are looking for artwork like yours. Thank you for joining the Keenlee mailing list!